You are looking at posts in the category hoofcare. Posted on April 3, 2019 by Jerrilee. Categories: breed, handicap, health, hoofcare, therapy. Flexor tendon flaccidity or tendon laxity is a relatively common limb deformity seen in newborn foals usually involving the hind limbs although all four limbs can be involved. Weak flexor tendons is thought to be the cause which results in digital hyperextension where weight-bearing is placed on the palmar/plantar aspect of the proximal phalanges and the toe of the hoof is raised off the ground. The condition often tends to self-correct within days after birth as the foal gains strength and is allowed moderate exercise. However the tendon laxity often persists and it is not uncommon to see a fool that still has digital hyper-extension at 4 weeks of age. Treatment is sequential depending on the severity of the tendon laxity and the response of the foal to treatment. Therapy begins with controlled exercise allowing the foal access to a small area with firm footing for 1 hour three times daily, the toe of the foot can be shortened and the heels can be rasped gently from the middle of the foot palmarly/plantarly to create ground surface and a palmar/plantar extension can be applied if necessary. This extension which extends approximately 3-4 centimeters beyond the bulbs of the heels immediately relieves the biomechanical instability. A cuff-type extension shoe is commercially available or a small aluminum plate extension with clips. In either case, the author feels that either type of extension should be attached with adhesive tape rather than a composite if the foal is less than 3 weeks of age as this avoids excessive heat being applied to the fragile hoof capsule as the composite cures and prevents contracture of the hoof capsule at the heels. Regardless of the method of application, the extensions should be changed at 10 day intervals. Bandaging the limb is contraindicated as this will further weaken the flexor tendons. Angular limb and deformities are common limb abnormalities in foals that require early recognition and treatment. The pathogenesis of this problem is not clearly understood. Angular limb deformities can be classified as either congenital or acquired in the first few weeks of life. The primary lesion is an imbalance of physeal growth; for various reasons, growth proceeds faster on one side of the physis. Posted on July 9, 2018 by Jerrilee. Categories: equipment, history, hoofcare, riding. No longer are home owners and horse fanciers interested in the ‘concrete statues’ of old. Today’s garden is alive, thriving and re-inventing itself in a whole new form. From sophisticated residences in the heart of busy Manhattan to lavish villas in Melbourne, a lush green garden is as popular an addition as ever, especially when flavored with unique pieces of art. This garden sculpture of a “Black Stallion Running Horse” is made out of mosaic tile. The horse 7-1/2 feet long, weights 60 lb. and is designed to stand on a hillside, pasture, gate entry or as a focal point in the yard or garden. Made by DolphinsbyCindy.com. Garden art can either dominate, or supplement nature’s plants in your garden. There is no question that adding amazing art pieces bring novelty and distinction to the backyard. But you can also create your own. Look around your barn to see what you can use to create your own show pieces. From horseshoes nailed onto broken rakes, to chewed and broken fence boards converted into garden borders, by recycling those well worn tools and utensils with your favorite flowers and plants you can create a true garden sensation. While it may not be as elaborate as the art by Tom Hill, you may be just as delighted with the results of your own project. Posted on May 1, 2018 by Jerrilee. Categories: equipment, handicap, health, hoofcare, therapy. Natural hoof trimmer Linda Harris of thehappyhoof youtube channel explains the importance of the bars of the hoof, and the 3 V’s of natural balance. In trimming the bars you are just getting what ever may be laid over the sole off of it, so that as the hoof wall grows past the sole so will the bars (instead of laying over towards the outside wall and growing sideways, covering the sole in the seat of the corn). You do not want to dig the bars down past the sole. You do not want to reduce the bars to where any leverage on the heels will push them forward, because then your heels will also go forward. That whole area of the heel buttress is formed to try and hold the heels in place. In this photo, the inside bar (pictured on right and not yet trimmed) is slightly laid over with a chunk laying on the seat of the corn of the sole. The outside bar (pictured left and just trimmed) shows you where the white line is. As you’re trimming, keep in mind that your actions in the back also affect the front of the hoof. NEVER take off any of the back half of the foot without taking some of the front half, even though it may seem like the front half did not grow much, and here is why. The front half of the hoof is where the main sole ridge is that protects and surrounds the coffin bone. That sole ridge will grow forward with the wall and get thicker and thicker and begin to raise the front of the foot as well as grow gradually forward. With some horses, the wall will grow out past that sole ridge and you automatically know to trim or cut it off. With others the sole ridge will just grow and thicken along with the wall and so you think your foot has not grown. This is even worse if the toe in general has been stretched forward and is at a low angle because it will “seem” like the wall hasn’t grown at all. This then eventually creates a situation where the sole ridge, that is supposed to be thickest at, and surrounding the rim of the coffin bone, is actually out in front of it. So then you have thick sole ridge not under the actual toe of the inner foot, (as it’s supposed to be). Therefore the inner foot itself is sitting behind the toe callous, on thin flat sole. This slowly drops the toe of the inner foot down low and closer to the ground. This is one reason why we rocker the toes to try and thin that sole ridge which is out of place. This allows the wall to grow down very tightly connected to the very end of the internal foot where it will once again connect with the sole in that area. It grows down to the ground and then RETAINS that sole ridge under the front perimeter of that internal foot where it’s supposed to be. Now this picture looks pretty good, the walls are trimmed down and the bars are defined and fine. In the end the final and ultimate goal is to get the walls to grow down without being leveraged so they will reconnect in the right spot at the very bottom of the internal foot with the sole that grows from the sole corium. From there they continue to the ground and contain that V under and around the V of the internal foot. What are the three V’s of the hoof? V Coffin bone / which is hard but also a softer bone than the rest. V Sole corium attached to coffin bone / which is soft and padded full of blood. V Wall and sole ridge. Now we can not undue whatever prior damage may have been done to the feet. BUT when the hoof capsule is as correctly grown and reconnected as close as possible in alignment with that internal foot, the body has a “chance” to heal itself, proving our bodies and the bodies of animals are in and of themselves wondrous things. Posted on April 28, 2018 by Jerrilee. Categories: breed, health, history, hoofcare. Having worked with Bureau of Land Management wild horses in past years and raised various strains of Spanish Mustangs some of which were descendants of founding stock directly from the wild, I have seen some varying differences in hoof type due to terrain and environment. Example 1) Cerbats from Marble Canyon in the Cerbat Mountain range near Kingman Arizona. The Cerbat as a strain of Spanish Mustang and generally untouched by man until mid 90’s had managed to evolve a very steep angle as a herd to a horse. Reason being or seeming to be is the rocky cactus terrain they lived in for over 200 years. They had to dig for water sometimes 6 feet to survive some waterless summers. The hoof is round narrow and upright. The steep angles and high heels protected their heels and coronet bands from cactus and sharp rocks. An average angel for a typical Cerbat and many if not most of their 1/2 crosses would be 60 degrees, with few standing at 58 degrees and many as high as 63 degrees. Their walls are typically denser, thicker than other Spanish Mustangs or Wild horses form other areas. The early Cerbat as a group had tendencies to be laterally gaited as well. They created their own mustang roll from constant digging. Example 2) Horses descending from Yellow Fox, SMR#2 a Montana Cheyenne Indian Reservation horse are descendants raised on Wyoming prairie of over 3000 acres. Very rocky but unlike Marble Canyon, Wyoming’s rolling hills spread out over the 3000 acres dotted with prairie dog holes. The typical hoof is large, wide and flat, and low heels with angles nearing 55 degrees. 56 would be pushing high heels on these horses. Example 3) The early Book Cliff horses from Utah. These would be the 1930-40’s stock prior to the draft infusion into the herds. Small, round, flint-hard hooves, these feet are closest to the ideal model that is used to describe mustang healthy hooves. Book Cliff blood still have these type of feet even raised on pastures which says something for genetics and natural selection that takes generations to make changes. Most studies of wild horses feet are based on Nevada wild horses who also live on mostly sandy slide rock and gravel like surfaces, with a few from woodlands up north. Example 4) the Corolla Banker horses who live along ocean beaches and in marshlands have pony-like feet that grow quite long and are not worn off to the same degree as we see in the mustang studies. These horses have tough healthy hooves that tend to be a bit longer. The angles are pretty average also. They have a long history of soundness. When trimming horses, one should take into consideration what genetics and what environment shaped the animal in front of them. You can’t trim a Cerbat like you would trim a Corolla. You may be able to trim a Book Cliff bred horse similar to a Nevada wild horse, but the Yellow Fox bred horses (regardless of the pasture or prairie where it was raised), still have a genetically different hoof to tackle. When considering the mustang roll on your horse it is necessary to consider what kind of surface the horse is walking on and what kind of load they are carrying. A horse working in sand may not need the mustang roll in order to break over. For instance, the Bedouin Arabian is not known for a natural mustang roll yet they are world renowned for their flint hard feet and soundness in their homeland. Posted on August 21, 2017 by Jerrilee. Categories: handicap, health, hoofcare, riding, therapy, training. What Was A Fire Horse? »« What is Riding ‘Forward’? Posted on March 4, 2017 by Jerrilee. Categories: handicap, health, history, hoofcare, therapy. New information regarding the changes in the coffin bone of the hoof have been released. The Fischer Equine Lameness Group have provided their in depth results into the remodeling of bone in the hoof during the time it remains shod. This information is a must for all horse owners! From the “Heal the Hoof” web site: Sheri and her husband Mark, an orthopedic surgeon, fly internationally and present lectures on Wolfs Law of Orthopedics and how this affects the equine distal limb. Their presentations have been given in Europe and throughout the US. Recently, Sheri has lectured to the veterinarian students at the University of Minnesota and several veterinarian clinics throughout the US. Excerpts from their article: Wolfe’s law refers to how bone adapts itself to a variety of influences. Bones can remodel in a generalized fashion – that is, affecting the whole bone, or even the whole skeleton; or they can remodel in a very specific fashion in response to a local influence. It is important to remember that bone remodeling is a balance, and many factors can influence the balance, so that the net effect is either bone gain or bone loss. Most of the clinical situations we encounter in both human and equine situations involve bone loss to an extent to which problems occur. According to Wolfe’s Law, failure to stress and stimulate bone by the mechanical forces generated by weight-bearing and muscles results in the activation of osteoclasts, leading to generalized loss of bone content and ultimately strength. The importance of exercise with respect to bone strength is well known in many human studies. This would suggest that any program which includes any significant amount of stall rest would promote the loss of bone. In a similar manner that cast treatment or immobilization can protect bone from stress, resulting in bone loss, application of a mechanical stress-sharing (i.e., aiding the bone in bearing a stress) device to bone can have the same effect. An example of this would be the use of horseshoes. An example of altered hoof weight bearing stresses affecting bone would be a deformation of the hoof capsule resulting from the horseshoe. The horseshoe puts direct pressure on the sides of the hoof, causing contraction and then bone loss due to altered stresses. Removal of shoes, depending on the timing as well as other influences, may allow the coffin bone to remodel. It seems obvious, however, that promoting a situation which several million years of evolution adapted the coffin bone for – that is, not applying horseshoes and keeping the coffin bone ground parallel within the hoof capsule – would make the most biological sense. In other words, never putting shoes on the horse, and keeping the coffin bone ground parallel for even distribution of stress along the edges of the coffin bone, would make the most sense for the bone according to the arguments advanced in this report. In most cases, bone loss is recoverable once the conditions are changed to promote physiologic stress on the bone and to allow for the inflow of nutrients. Posted on March 1, 2017 by Jerrilee. The above x-rays indicate the horse’s struggle for soundness when the coffin bone is affected. Many readers have asked for more information regarding the terms used for hoof deviations. Rotation of coffin bone: the coffin bone (P3) of the horse has dropped downward toward the interior bottom (sole) of the hoof. This means it has separated from the flesh (laminae) that hold it to the toe wall. In extreme cases the sharp point of the bone can fall far enough to cut through the sole of the hoof. The bone is still connected to the interior laminae on the sides, or quarters, of the hoof. Most cases can be fixed through correct trimming and hoof boots. Sinking of the coffin bone: the coffin bone is completely detached from all the laminae of the hoof wall. The coffin bone rests on the interior sole of the hoof. Correct trimming and boots ease this problem but I have no documentation of a full correction yet. 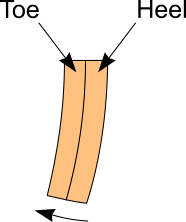 White Line Separation: the flesh (laminae) are in process of separating from the coffin bone. Again, fixed through correct trimming. Flaring: in most cases,the laminae have finally separated from the coffin bone resulting in rotation, or dropping, of the toe portion of the coffin bone. Oftentimes flaring and white line are used synonymously though there is a difference. Mechanical Founder/Road Founderof the hoof: This is the term used for sinker & rotation of coffin bone which came about due to hard ground,shoeing,or the daily wear of a long toe that eventually separates the wall from the coffin bone. Laminitis Founder:the laminae (flesh holding the coffin bone to the hoof wall) become inflamed and dropped their attachment to the coffin bone. The source of the inflammation must be determined to stop the founder in this case. Typically the cause is the diet and the shoeing of the horse; other causes include recent trauma,squalor conditions,abusive handling. To understand in depth the care and trim required for Founder read Marjorie Smith’s full explanation. Coffin Bone Remodeling »« What Breeds Were Used In The Wild West? Posted on March 10, 2015 by Jerrilee. The easiest way to explain this new model for laminitis is to look at the hoof as a simplified structure, broken down to its basic components, this enables an easier understanding of what is happening. 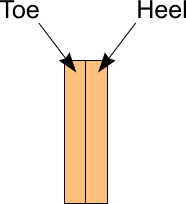 To examine the effects of normal and laminitic hoof growth, a flat rectangle of hoof can be used to represent a section of hoof (Fig. 1), as new horn is produced in equal amounts on each side of the rectangle, the hoof section grows without distortion. When laminitic hoof growth is examined in the same way, one side of the hoof is growing faster than the other, horn produced under these conditions will grow in a curved or distorted manner (Fig. 2), the lower extremity of the horn will be deflected forward. By increasing the complexity of the model to a simple hoof capsule consisting of three sides, a front or dorsal wall and two sides that represent the medial and lateral quarters, we now have an approximation to a hoof capsule. In the normal simplified hoof the dorsal and quarter areas are growing at similar rates and the hoof grows down in a consistent way (Fig. 3). In the laminitic foot the quarter areas are growing faster than the dorsal wall and the hoof grows in a curved manner to accommodate this difference (Fig. 4). The dorsal wall now has a dished dorsal surface, caused by the curved shape of the medial and lateral walls deflecting the dorsal hoof wall forward. It is proposed that when a horse encounters a systemic disease that is known to cause laminitis, one of the first events will be an increase in rate of growth at the quarters (Fig. 8). This increase in heel growth does not initially cause pain but eventually after a period of time, which may be hours or several days, the hoof capsule will distort beyond the limit that can be tolerated by the laminae. The distorting hoof capsule will then traumatise the laminae and tissues that are situated between the hoof and distal phalanx (pedal bone). In the early stages, any hoof distortion may not be obvious to the naked eye but at a laminar level it will cause pain. (Fig. 9). This delay between the triggering event and the onset of pain is consistent with a developmental or pre-acute phase of laminitis, while the trauma induced in the sensitive tissues will cause the symptoms that have previously been identified as a vascular crisis. In the early stages of the acute phase, distortion will be concentrated at the distal border of the dorsal hoof wall. As the heels continue to grow the dorsal wall will be elevated away from the distal phalanx in a peeling motion as the distortion migrates up the dorsal wall (Fig.10 – Arrow B). Peeling provides a better explanation for the separation observed between the distal phalanx (pedal bone) and the dorsal hoof wall, it is the most efficient method of mechanically separating two strongly bonded surfaces and requires less force, peeling would also be very painful. When the peeling process has separated enough laminar attachment, the distal phalanx will be detached from the dorsal hoof wall. As the distal dorsal wall is lifted, the solar horny plate will be pulled upward towards the distal border of the distal phalanx. This upward movement of the horny sole will compress the solar corium, causing pain within the solar corium and compromise blood flow by entrapment (Fig. 10 – Arrow C). Bruising is often subsequently seen in this area of the sole after laminitis and is evidence of this trauma to the solar corium. As the distal dorsal wall is lifted, the proximal border of the dorsal hoof wall will be pressing inward, again causing pain and compromising blood flow (Fig. 10 – Arrow A). Horn growth at the proximal border of the dorsal hoof wall is often restricted in severest forms of acute laminitis. By including the hoof capsule in a causal role in laminitis, the qualities of the hoof can be seen as influencing the intensity of pain felt by the laminitic animal. The level of pain experienced during the initial phases of acute laminitis can be correlated to the shape and strength of the hoof capsule. In round feet, hoof distortion will spread from the toe medially and laterally towards each heel, causing the whole hoof to expand open, this will predispose the distal phalanx to sinking as a greater area of laminar attachment is lost. Long narrow hoof capsule shapes will tend to predispose the foot to rotation as most of the distortion will be concentrated at the toe of the hoof. This new interpretation of laminitis is still in it’s formative stages, it is hoped that further research will be directed toward confirming that this model is a more accurate account of the changes seen in the feet of equines suffering with laminitis. Time will show how accurate this proposed model is. Whatever the outcome of this research, we must continue to look for ways to help the laminitic equine. Posted on September 10, 2013 by Jerrilee. Categories: breed, health, hoofcare, therapy. Remember that when the clinical signs of laminitis are seen, separation of the laminae is already occurring. • Prompt attention to your horse is imperative to try to minimize these changes. • If your horse develops laminitis contact your vet. • If the horse will pick up its feet easily, apply frog supports. • Walking the horse is contra-indicated but may be necessary to remove the horse from the cause of the laminitis e.g. from pasture. • In this case it may be safe to walk the horse a short distance, with frog supports on, if it can walk relatively easily. • If the horse is very reluctant to walk, wait for your vet’s arrival. • It may be necessary to box your horse back to the stable. • Stable the horse on a deep bed so that it is happy to lie down if it wants to. When deciding on what angle the feet are trimmed, the question that we have to consider is whether the pull of the deep flexor tendon is of more significance than the effect of the weight of the horse on a tilted pedal bone. It would appear that most are agreed that the aim [of the trim] is to establish weight bearing “along the entire solar surface” (O’Grady), or to “all parts of the hoof capsule” (Strasser) and that this is brought about by trimming the foot with a P3 solar surface that is parallel to the ground. As weight is applied down the leg, the load is spread more evenly around all the laminae rather than particularly down the dorsal wall. It will also reduce the pressure applied by P3 on the solar corium at the toe. This will hopefully reduce the pain in the feet and with it the reflex contracture of the deep flexor muscle and thus reducing the tension in the deep flexor tendon. (I now advise massage of the deep flexor muscle following trimming of the heels). There should be less pressure applied by the extensor process of a rotated P3 on the coronary papillae of the dorsal hoof wall and this should allow more even growth of the hoof. There will be a more even pressure around the whole of the coronet and this will mean that new horn growth is more likely to grow down parallel to the dorsal surface of P3 allowing the basement membrane that has not been irrevocably damaged to bind, as best it can, the epidermal and dermal laminae together providing a stronger and more stable foot. Chronic founder cases are unlikely, certainly initially, to be involved in great athletic activity, but when there is sufficient new hoof growth and stability is achieved we can then trim the foot to a more “normal” angle. However, if we lower the heel we will have a toe that is “long”, particularly if there is already distortion of the dorsal hoof wall. It is imperative that the toe is taken back sufficiently to allow easy break-over and thus avoid any pulling on the weakened laminae by the dorsal wall otherwise it will be pulled away from the bone. The centre of mass is moved posteriorly, thus putting more weight down the dorsal wall and pressure on the solar corium. There is likely to be more distortion of the coronary papillae of the dorsal hoof wall. This will, in turn, result in slower growth of horn at the toe compared to the heel.